*DON'T MISS YOUR CHANCE! LAST 2 NEW HOMES AT VANCE LANDING! SOUGHT AFTER GREENBRIER AREA OFFERS EASY ACCESS TO INTERSTATES, HOSPITALS & MILITARY BASES WITH VARIETY OF DINING, SHOPPING & ENTERTAINMENT MIN AWAY. 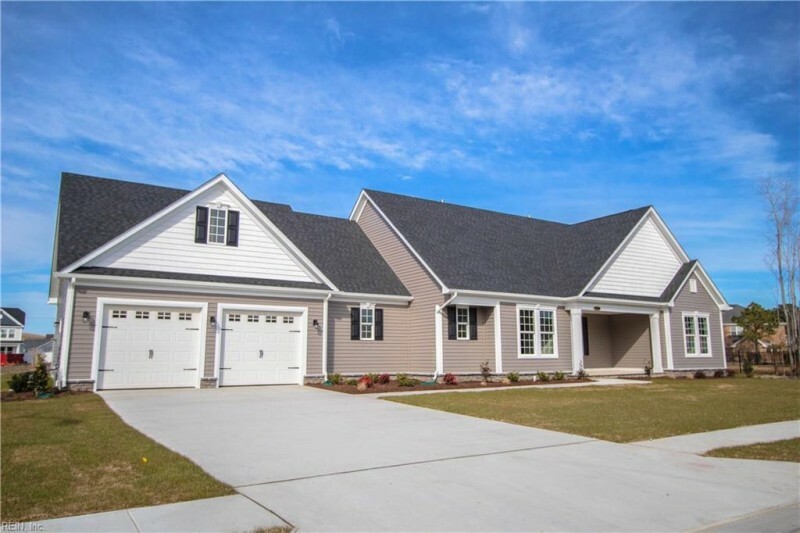 COMING HOME TO THIS MOVE IN READY RANCH WILL FEEL LIKE A DREAM, TUCKED AWAY OFF ELBOW RD, VANCE LANDING OFFERS ESCAPE FROM THE HUSTLE & BUSTLE EASY ACCESS TO INTERSTATES & A VARIETY OF SHOPPING & DINING OPTIONS. “THE JASMINE” IS DESIGNED WITH SPACIOUS COMFORT IN MIND WITH ALL YOU NEED ON THE FIRST FLOOR. CUSTOM CABINETS PAIRED WITH DESIGNER COUNTER TOPS & ENERGY STAR APPLIANCES, PANTRY, LARGE CENTER ISLAND WITH BAR TOP & BREAKFAST NOOK ARE JUST A FEW OF THE STAND OUT KITCHEN FEATURES. THE GREAT ROOM WITH GAS FIREPLACE LEADS TO REAR COVERED PATIO. MASTER SUITE BOASTS TRAY CEILING & EN-SUITE BATH WITH DOUBLE BOWL VANITY, SOAKING TUB, SEPARATE SHOWER & HUGE WALK IN CLOSET. SECOND FLOOR IS HOME TO LOFT AREA WITH A FULL BATH. CLOSING COST ASSISTANCE WHEN USING BUILDER'S PREFERRED LENDER! Ready to visit 1312 McRowland? Request a free property tour! Send me more information about the listing at 1312 McRowland, Chesapeake, VA 23320, MLS# 10240030. This 3 bedroom, 3 bathroom home located at 1312 McRowland, Chesapeake, VA 23320 has approximately 2,996 square feet. It is currently listed for $470,000 and has a price per sqft of $15,688. This home is currently Sold under the MLS#: 10240030. This listing is provided by Today Homes Realty LLC. 1312 McRowland Lane, Chesapeake was built in 2019. It has Garage Att 2 Car, 2 Space parking.The kitchen includes Dishwasher, Disposal, Dryer Hookup, Energy Star Appliance(s), Microwave, Range, Washer Hookup. 1312 McRowland is part of the All Others Area 32 neighborhood located in 23320.